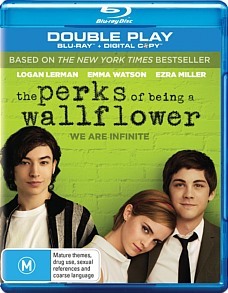 The Perks of Being a Wallflower Blu-ray Review The Perks of A Wallflower is a deep and touching film that doesn’t truly reveal itself until the final moments with a twist that is subtle yet shocking. It’s contemporary filmmaking at its finest with terrific cinematography and performances from its three young leads who all deliver their best work to date. Too often have I heard of people brushing off The Perks of Being a Wallflower as another routine entry into the teen drama genre; it’s anything but that. Director and screenwriter Stephen Chbosky (who also wrote the 1999 book the film is based on) has created an exceptionally smart and heartfelt film that deals with isolation, acceptance and relationships on a disturbingly real level. Charlie (Logan Lerman) is a loner and he knows it. Having to deal with both the deaths of his role-model aunt and his best friend (who committed suicide) he finds it hard to fit in during freshman year of high school, but can you really blame him after what he’s been through? Charlie wants to make friends but he can’t because of his shy nature until eventually he befriends to senior students, Sam (Emma Watson) and her stepbrother Patrick (Ezra Miller). Sam and Patrick eventually bring Patrick out of his shell, which is such a satisfying thing to witness as a viewer because it’s almost heartbreaking to see Charlie’s miserable eyes stare down at the ground in sadness wherever he goes. All credit must go to Lerman for his terrific portrayal as Charlie, who has the ability to make you sympathise with him one minute and question him the next. Charlie is such a complicated character to dissect and warm to which Lerman has nailed on the head with his performance. Watson and Miller deserve praise for their performances as Sam and Patrick, who become the perfect role models for Charlie as he breaks out of his shell. Other commendable performances include Paul Rudd as Charlie’s English teacher. The Perks of A Wallflower is a deep and touching film that doesn’t truly reveal itself until the final moments with a twist that is subtle yet shocking. It’s contemporary filmmaking at its finest with terrific cinematography and performances from its three young leads who all deliver their best work to date.